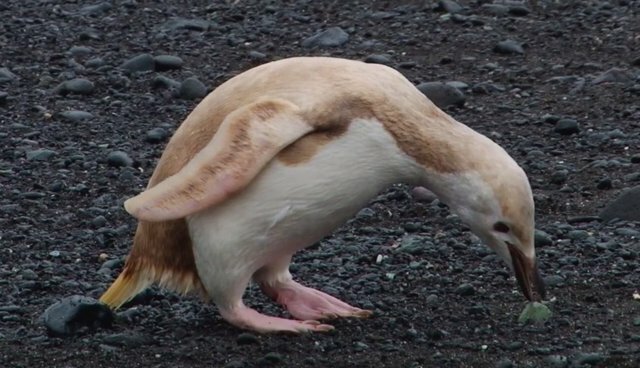 In a dramatic departure from the typical black and white feathers that give penguins their distinctive tuxedoed appearance, one novel little bird has been spotted looking a bit more casual with a very unusual khaki-colored coat. David Stephens, a naturalist with National Geographic, ran across the oddly-hued chinstrap penguin while filming on the Aitcho Islands in Antarctica. Stephens says the bird's lighter plumage derives from a rare mutation called leucism which, unlike albinism, leaves a faint trace of the common feather patterning instead of turning it entirely white. "It's something we hardly ever get to see," says Stephens. "So quite an exciting thing for us to witness."